Nepali fruit market is dominated by fruits imported from India and China as domestic production is far less than the market demand. Import of fruits and nuts into the country has increased by 21 percent in the first five months of current fiscal year compared to the previous fiscal year, according to statistics by Department of Customs. “About 90 percent of fruits in our market come from India and China. On top of that, Nepali fruit farms supply limited varieties of fruits only,” said Dipendra Kumar Shrestha, vice president of Nepal Fruits Wholesalers Association (NFWA). The imports have been increasing in accordance with the decreasing production along with increasing demand in the country, according to fruits traders. Fruits and nuts worth Rs 3.4 billion were imported in the first five months of Fiscal Year 2015/16, which increased to Rs 4.7 billion in FY 2016/17 in the same time period. 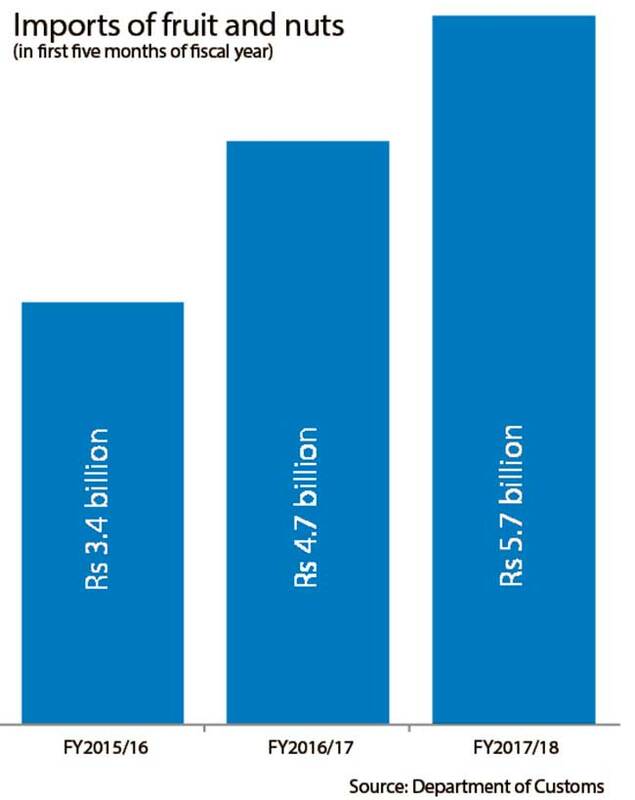 The figures further increased to Rs 5.7 billion in the first five months of the current fiscal year. Among the fruits imported, Apple is imported chiefly from China whereas other major fruits like banana, oranges, grapes, mango, etc are imported from India. Officials of the Fruits Development Directorate (FDD) have confirmed that the import of fruits has been increasing despite the targets of the directorate to increase the domestic productivity. The market of NFWA at Kuleshwar, Kathmandu is among the largest fruit markets in the country. The wholesale market supplies fruits to the retailers in Kathmandu, Lalitpur, Bhaktapur, Kavre, Dhading, and many other districts around Kathmandu. According to the officials of the association, the market share of Nepali fruits in the markets in and around the valley is less than 10 percent and the domestic supply is limited to only very few fruits. "Districts like Kavre, Gorkha, and Syangja supply oranges in a limited amount and a portion of Banana supply is from Chitwan," said Dipendra Kumar Shrestha. “We have limited profit when we buy fruits produced in the country. For example, our cost price is higher when we buy banana from Chitwan,” added Shrestha. Wholesalers in the Kuleshwar market import fruits independently from India and China in the market managed by the association. Traders in the market have said that they are not selling Nepali fruits also because the transportation cost is very high. “These apples are from China. It is costly to transport Nepali apples from Manang, Humla and other apple producing districts in Nepal,” said Saroj Shrestha, pointing at the cartons of apple in his shop. “I import bananas from Madras, India. It is not the season of banana in Nepal,” said Shatrudhan Kumar, another wholesaler. Other wholesalers in the market dealing other fruits like pomegranate, Indian oranges (Kinu), guava, jack-fruit, etc have also said that they have been importing these fruits from India. Officials of the association have said that the demand for fruits have increased in and around Kathmandu in the past few years owing to increase in population and increase in awareness about health aspects of fruits.